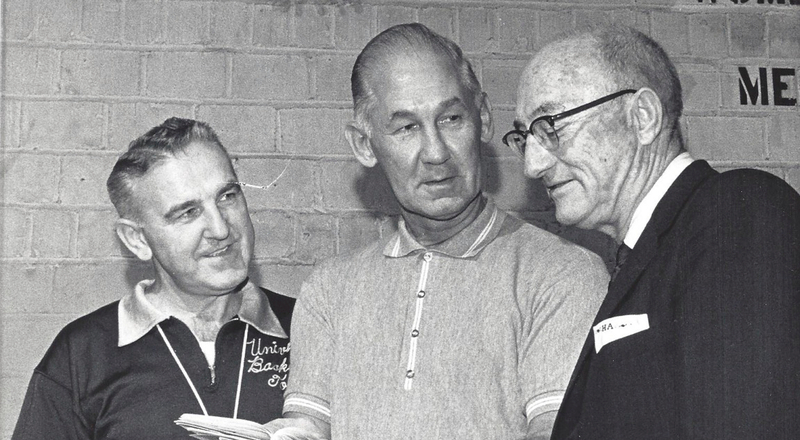 In 1940 Chuck Chuckovits was one of the nation's best-known basketball players and in the 1950s he was equally famous as a basketball official. A graduate of Akron St. Vincent High School, Chuckovits starred in 1937-39 on the first University of Toledo teams to play intersectional schedules. The Rockets won 49 and lost 20 in the seasons during which Chuckovits averaged 17.2 points per game and accumulated 1,189 points. When he scored 41 points against Adrian College in December of 1937, it was a national record. As a senior he scored 449 points – then an Ohio college record. In 1941 he was the leading scorer (24.3 ppg) and the most valuable player in the National Professional Basketball League. In 1942 he was named “Pro Player of the Year” by the Chicago Herald-American. He played as member of the Hammond Ciesar All-Americans and the Toledo Jim White Chevrolets. 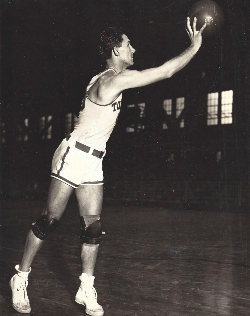 He received league MVP honors with Toledo during the 1941-42 season after leading the NBL with an 18.5 points per game average. Later he became a basketball official, working college games in the Big Ten, Mid-American, and Missouri Valley conferences. He officiated the NCAA final in 1957 and 1959. He also refereed in the National Basketball Association. Chuck Chuckovits died on August 12, 1991 at the age of 79.